The Sigma 10-20mm f/4-5.6 EX DC HSM Lens is a very good quality ultra-wide angle lens with a feature that everyone can love - a relatively affordable price tag. I highly recommend that APS-C sensor format body owners include a 10-20mm (or similar) focal length lens in their kit as such a lens is extremely useful. 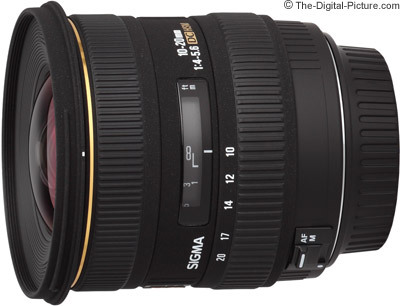 And the Sigma 10-20mm f/4-5.6 could be a good choice to fill your UWA lens slot in your kit. The Sigma 10-20mm f/4-5.6 EX DC HSM Lens review directly follows the Sigma 10-20mm f/3.5 EX DC HSM Lens review, and because these two lenses are so similar, you will also find their reviews to be very similar. The other completed ultra-wide angle lens reviews from this test group include the Sigma 8-16mm f/4.5-5.6 DC HSM Lens Review and the Tokina 11-16mm f/2.8 AT-X Pro DX Lens Review. Many of the same comparisons and information are shared across each of these reviews. The Sigma 10-20mm f/4-5.6 sample picture above was taken with a Canon EOS 60D at 10mm, f/8. The relatively close-to-the-snow-horse shooting position causes the horse to appear larger relative to the background subject than it really is. This technique works especially well when photographing a fisherman's catch or anything else you want to emphasize (or enlarge). Getting the proper focal length or focal length range is a very important criterion when selecting a lens. And the first attraction to any ultra-wide zoom lens is in fact the ultra-wide focal length range, so let's review what this focal length range looks like. 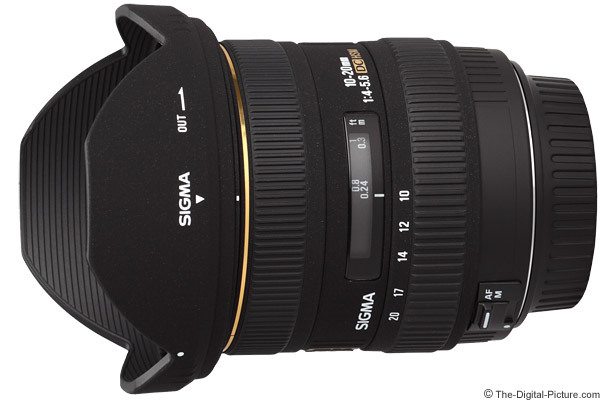 Being a Sigma "DC" (Digital Camera) lens, the Sigma 10-20mm f/4-5.6 has a smaller-than-full-frame image circle designed to work only on APS-C/1.6x/1.5x FOVCF DSLRs. All of the ultra-wide angle lenses compared in this review are the same in regards to this smaller image circle. Thus, the focal lengths shown for all of the lenses below are similar to 1.6x longer focal lengths on a full frame SLR or DSLR. The Sigma's 10-20mm frames like a 16-32mm lens frames on a full frame DSLR. Following is an example of the focal length range of this lens. Click on the image below to view a much larger comparison including 4 other ultra-wide angle lenses. Use the widest focal length you have available in your kit (perhaps 18mm or 24mm) to closely match one or more of the above focal lengths and base your own comparison on that selection. When deciding which focal length range is best for you, consider the lens(es) you already have and how the ultra-wide angle zoom focal length range aligns with it. Also consider which focal length range you need on the lens that is mounted while using this lens (with no lens change required). In terms of focal length ranges, the focal length numbers mostly tell the difference. 8mm is wider than 10mm and 24mm is longer than 20mm. The Sigma 10-20mm f/4-5.6 EX DC HSM Lens and its Sigma 10-20mm f/3.5 EX DC HSM Lens sibling have the shortest focal length range aside from the Tokina 11-16, but the overall focal length range differences are not great and unless your needs are extreme, you will probably settle into the range you have to work with. Like the rest of these focal length ranges, The 10-20mm range will complement 18-something mm lenses very nicely. Note that the ultra-wide angle zoom lenses are so wide that they are not going to be the ideal general purpose lens for most people - they are still too wide for this purpose - even on the long end of the focal length range. 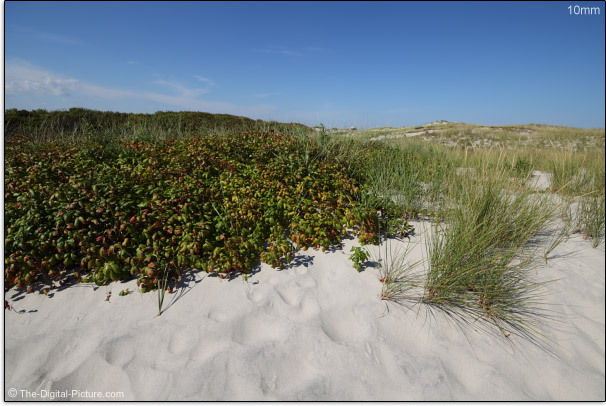 As I initially said in the Sigma 8-16mm Lens Review, a beach poison ivy patch as shown above is perhaps the most dangerous subject you want to shoot with an ultra-wide angle zoom lens. These focal lengths take in a very wide angle of view - and subjects must be close or otherwise turn into a tiny spec in your frame. One of the best ways to use an ultra-wide angle lens is to find a relatively close subject that you want to stand out, to have presence, in relation to the background. 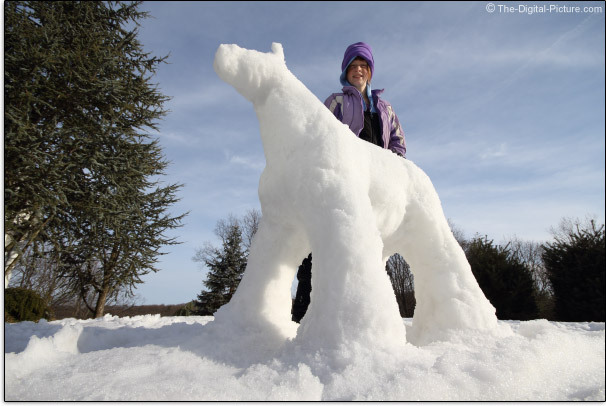 The snow horse above for example. Landscape photographers are one group that loves to find a close subject and frame it in a striking, vast, in-focus scene using the deep depth of field these ultra wide angles of view (with narrow apertures of course) give them. People are the one subject that you will not want to be too close to when shooting at ultra wide angles as they will appear perspective-distorted. And this means that, unless you are going for the big head/big nose look, group photos and environmental portraits are the type of people pictures this lens is most useful for. And caution is still required for these shots. Any group members closer to the camera than those in the back can appear larger (potentially much larger). There a many other uses for ultra-wide angle lenses including architecture (especially interiors) and automobile photography. Or you can simply capture a snap shot containing the big picture. Like most of the lenses in this class, the Sigma 10-20mm f/4-5.6 EX DC HSM Lens has a narrow max aperture, and the max aperture changes over the focal length range. While the max aperture starts at f/4 at 10mm, it is only f/5 at two short mms later - at 12mm. In this group, only the Sigma 8-16 has a narrower aperture. Here is a table that compares the max aperture for these lenses. The two fixed max aperture lenses in this group, the Sigma 10-20 f/3.5 and the Tokina 11-16 f/2.8, hold the aperture advantage. Users of the rest of these lenses will need to deal with wide open exposure settings that vary over the focal length range - narrowing with focal length increase. Of course, I most often use these lenses at narrow apertures anyway. Keep in mind that built-in flash coverage on most DSLRs will not cover most of the focal length range of this lens. Plan on an alternative method of flash lighting/diffusion if planning to use flash with this lens. With a wide open aperture, the Sigma 10-20mm f/4-5.6 EX DC HSM Lens has good sharpness across the frame and across the focal length range. My copy of this lens shows some softness in the mid-frame area from 12-14mm. Stopping down the aperture by one stop provides little change in sharpness over most of the range, though the mid-frame area gets sharper at 14mm f/8. At 10mm, the Sigma 10-20mm f/4-5.6 exhibits a moderate amount of standard (not wavy) barrel distortion. By 11mm, distortion is already changed to mild pincushion distortion. Pincushion distortion becomes moderate at 14mm and remains similar through 20mm. 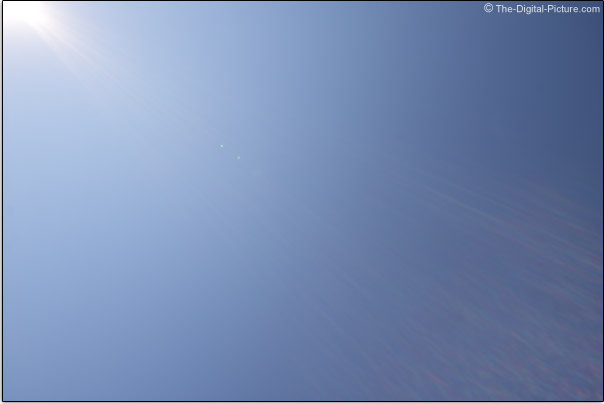 Like most APS-C lenses, the Sigma 10-20 f/3.5 shows some peripheral shading on APS-C DSLR bodies. Expect about 2 stops of vignetting at wide open apertures and about 1.5 stops of shading at f/8. 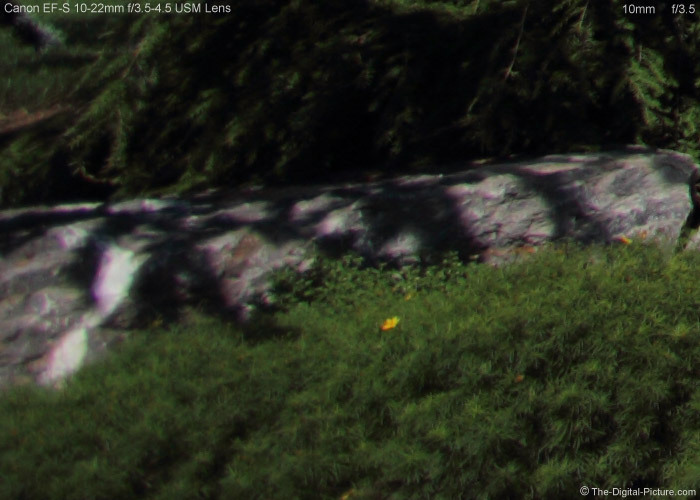 Even at f/11, about 1.2 stops of shading remains in the corners. Most of my outdoor time with this lens has been on snow-covered ground and I am indeed seeing my corners go darker by a noticeable amount at common f/8 landscape apertures. Flare is often very hard to remove in post processing, but this flare is basically impossible to remove from a picture. As the lens is stopped down, this effect becomes more noticeable. It is easy to get bright lights in an angle of view this wide, so flare can be an issue with the Sigma 10-20mm f/4-5.6. The Sigma 10-20 f/4-5.6 shows a comparatively small amount of CA (Chromatic Aberration) - limited mostly to the corners. Bokeh (background blur quality) is not easy to discern in a lens this wide - and is not real important for the uses I have for a lens such as this one. In the 10-20mm range, OOF details generally remain tiny, but this 6-aperture-blade lens does not produce especially nice blur quality. Unless you are using manual focus, focus accuracy is very important to final image quality. I have encountered focus accuracy problems with many 3rd party lenses, but the Sigma 10-20mm f/4-5.6 EX DC HSM Lens has been performing well in this regard. The 10-20 f/4-5.6's HSM (Hypersonic Motor) focuses quickly and quietly, and internally - without rotating the filter threads. FTM (Full Time Manual) focusing is available and the focus ring does not turn during autofocus. The raised AF/M switch is easy to reach with the left thumb. The adequately-sized manual focus ring is moderately-firm and is very smooth with no play. Focus distances are well marked and displayed in a window. Focus breathing (image changes size when focusing) is not an issue with this lens. In the short distance focusing category, the Sigma 10-20mm f/4-5.6 turns in average performance for this lens class. None of these lenses will be confused with a macro lens. The .15x MM (Maximum Magnification) value is high enough for a 10mm lens to produce a dramatic perspective. The rear-positioned (where I like it) zoom ring is adequately sized, has a nice amount of rotation and is smooth with no play or wobble. Zoom ring rotation is in the opposite direction of Canon lenses (the same as Nikon lenses). The Sigma 10-20mm f/4-5.6 does change size slightly when zooming, reaching full extension 20mm. The overall shape of this lens is smooth with slightly smaller ribs on the focus ring than on the zoom ring. The objective end of the lens has a wider diameter than the rest of the lens, but not as significantly so as with the Sigma 10-20mm f/3.5 Lens. I'm not a big fan of Sigma's lens finish (others love it), but the rubber-covered zoom and focus rings consume a significant portion of the lens and are nice to use. The petal-shaped lens hood is included. I like Sigma's center-and-side-pinch lens caps. It is easy to remove the caps even with a lens hood installed. The physical size differences between these lenses are not significant. The same lenses are shown below fully extended with their hoods in place. Two notables from the image above: The space between the Canon 10-22 and the lenses beside it increases significantly because of its ultra-wide lens hood, and the size order of these lenses practically reverses with the lenses extended and the lens hoods in place. Again, the physical size differences between these lenses are not significant - and all of these lenses have a very nice-to-use size. For many more comparisons, review the complete Sigma 10-20mm f/4-5.6 EX DC HSM Lens Specifications using the site's Lens Spec tool. The Sigma 10-20mm f/4-5.6 EX DC HSM Lens is solidly built and weighs in at the middle of its class - but these weight differences are not that big. The 77mm filter size is a very common one. If considering the use of a circular polarizer filter, be aware that very uneven results are likely when used at 10mm on this lens. For many more comparisons, review the complete Sigma 10-20mm f/4-5.6 EX DC HSM Lens Specifications using the site's Lens Spec tool. 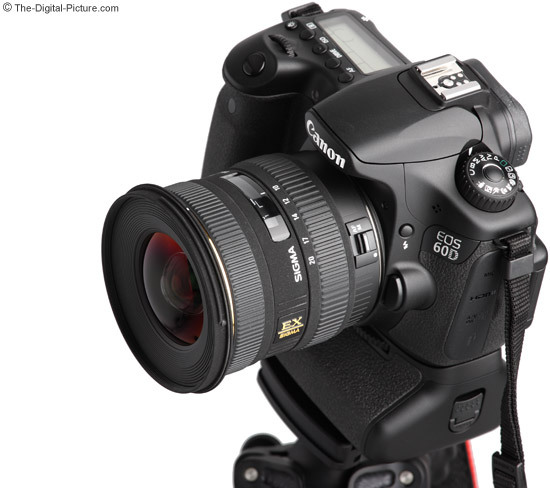 Here is one more look at this lens on a Canon EOS 60D with a Canon BG-E9 Battery Grip. Click on the image to see a comparison with 5 other similar lenses. While comparing these ultra-wide angle lenses, let's take a look at an image quality comparison. Click on the image below to view a 100% crop image quality comparison between 6 ultra-wide angle APS-C format lenses. The comparison loads in a new page. Use Alt-Tab/Ctrl-Tab to switch between pages as you read the commentary below. Note that the specific Sigma 10-20mm f/3.5 EX DC HSM Lens I reviewed performed much worse on the left side of the frame than on the right. This issue is obvious in the above comparisons where the Sigma 10-20mm f/3.5 lands in last or near-last place in all comparison settings (you will see a different performance by this lens in the ISO 12233 chart sample crops). Here are some comparisons. The Sigma 8-16mm f/4.5-5.6 DC HSM Lens shifts the focal length range to the wide end. The Sigma 8-16 has less barrel distortion at 10mm and slightly more pincushion distortion by 16mm. The Sigma 8-16 is a better overall performer from a sharpness perspective, especially in the corners. The 8-16 has less somewhat vignetting overall and an easier to correct flare pattern. The Sigma 10-20 has an about 1/3 stop aperture advantage within the shared focal length range, can accept screw-on front filters and costs noticeably less. The Canon EF-S 10-22mm f/3.5-4.5 USM Lens has less vignetting at the same aperture settings at the mid and longer focal lengths, has less distortion and is sharper. The 10-22 shows less flare at the wide end, but both have noticeable amount of flaring at the longer focal lengths. The Canon 10-22 is lighter, does not extend and has a small 2mm focal length advantage on the long end. The Sigma 10-20mm f/4-5.6 EX DC HSM Lens has less CA and costs noticeably less. Sigma's 10-20mm f/3.5 EX DC HSM Lens is, in practicality, a wider aperture version of the Sigma 10-20mm f/4-5.6 EX DC HSM Lens. The f/4-5.6 lens wears a significantly lower price tag - its biggest advantage. The two lenses have very similar image quality at identical settings with the f/3.5 being slightly sharper in the mid-wide focal lengths when both are stopped down. Both lenses have moderately strong barrel distortion on the wide end, but the f/4-5.6 does not have the wave/mustache shaped distortion the f/3.5 has. As expected from a wider aperture lens, the f/3.5 shows less vignetting at the same focal length and aperture settings, though stopped down differences are not significant. The f/3.5 performed better in my flare testing. The Tamron 10-24mm f/3.5-4.5 DI II Lens is the least expensive lens in this comparisons, but my experience shows that you may not even get what you pay for in this case. My first two copies of the Tamron 10-24 had to be returned for focus calibration issues. Also plagued with poor image quality, the Tamron's other advantages are a slightly lighter weight and an extra 4mm of focal length on the long end. The Tokina 11-16mm f/2.8 AT-X Pro DX Lens has a significant max aperture advantage over all of the other lenses in this test group. In direct comparison with the Sigma 10-20mm f/4-5.6 EX DC HSM Lens, the Tokina holds a big 1-2 stop advantage over the shared focal length range - and is a better choice for stopping action in low light. Both lenses have issues with flare. The Tokina is sharper at similar aperture and focal length settings, has less vignetting - even stopped down - and does not extend. The Sigma has less CA and a closer minimum focus distance with a higher maximum magnification spec. The Sigma 10-20 has a noticeably longer focal length range and a noticeably lower price tag. The Sigma 10-20mm f/4-5.6 EX DC HSM Lens is available in Canon (reviewed), Nikon, Pentax, Sony/Minolta and Sigma mounts. My standard disclaimer: There are some potential issues with third party lenses. Since Sigma reverse engineers (vs. licenses) manufacturer AF routines, there is always the possibility that a DSLR body might not support a (likely older) third party lens. Sometimes a lens can be made compatible by the manufacturer, sometimes not. There is also the risk of a problem that results in the lens and body manufacturers directing blame at each other. Sigma USA's 4-year warranty is far superior to Canon's standard 1 year warranty (Sigma's international warranty is also 1 year). Picking the best ultra-wide angle lens for your needs is not easy. I've liked the Canon EF-S 10-22mm f/3.5-4.5 USM Lens since it became available - it remains one of the best choices. The Sigma 8-16mm f/4.5-5.6 DC HSM Lens is also a good option - I especially like its extremely wide angles of view. The Tokina 11-16mm f/2.8 AT-X Pro DX Lens' f/2.8 aperture is very nice. And the Sigma 10-20mm f/4-5.6 EX DC HSM Lens is another fine option from this review list - especially from a price standpoint. If you don't have an ultra-wide angle lens for your APS-C DSLR, definitely get one.